In this advanced tutorial, we will learn the quirks of the find method in details, and see the behaviour of TDBM with more complex data model. If you are new to TDBM, you should start with the quickstart guide. In the samples of the quick start guide, everything happens to be fine because the object model is quite simple. In 80% of the cases you will encounter, you will be able to stick to the access model presented in the quick start guide. There are, however, cases where there could be several ways to join two tables, as shown below. In the example above, we added a company table. A company is attached to a country. A user is attached to a company, and still, a user is attached to a country (for instance, its birth place). Therefore, a user can be attached to a country that is different from the country of its company. Will we get the users who are born in $country or will we get the users whose company's country is $country? The code above is to some extent ambiguous. How will TDBM decide? The answer lies in the first design choice of TDBM: Simplicity. TDBM will choose the simplest way to go because it is likely that this is what the developer meant. Here, obviously, the developer meant that he wanted the country of the user, so this is what he will get. 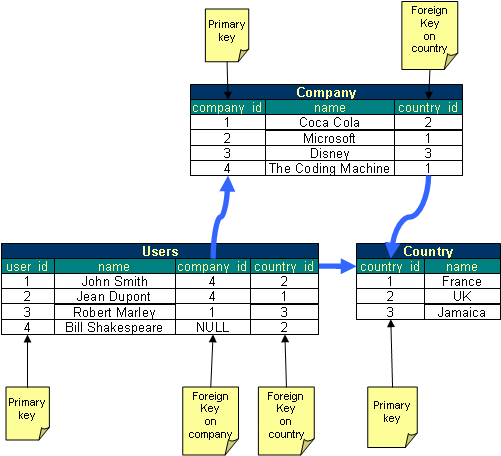 For TDBM, the simplest way is the way that requires the less joins between tables to get to the result. there is no way to know if it more likely that he wanted users from the birth country or from the work country. So TDBM will throw an ambiguity exception. This exception will inform the user that its request is ambiguous and that he should solve it. This exception message is quite clear on the ambiguity. Solving ambiguities is always possible by manually specifying joins in your queries. Note: If your data model has a lot of loops, you will likely face a lot of ambiguities. TDBM is very well suited for simple models. If your database model is complex enough to feature several of these loops, maybe TDBM is not the best tool for you. There are other great tools more suited for those use cases like Doctrine ORM for instance.